The City of Delaware is one step closer to adding a new fire station to help service the southeast quadrant. 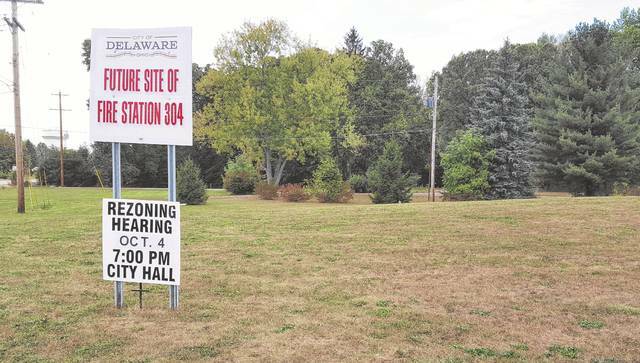 On Wednesday, the city’s Planning Commission approved the preliminary and final development plans for the construction of Station 304 on 4.1 acres of land located at the northwest corner of the Cheshire Road/Glenn Parkway roundabout. City council must also approve the plans. To handle the city’s growth over the past decade, voters in 2010 approved a fire levy to build and staff additional fire stations. In 2012, the city constructed Station 303 on West Central Avenue. Fire Chief John Donahue told commission members he’s excited about the project and wanted to start construction immediately after Station 303 opened five years ago. “This is going to be a darn good-looking building that’s really going to fit into the culture and aesthetics of our southeast quadrant,” he said. Pending council’s approval, Donahue said, the city could break ground on the station as soon as the second week of November with the project expected to take a year to complete. Along with recommending to council that it approve the preliminary and final development plans for Station 304, the commission also unanimously approved for council’s review a request to formally rezone the proposed site to A-1 Agricultural District and a conditional use request for the station to be constructed in the A-1 district. Zoning Administrator Lance Schultz said when the land in question was annexed into the city, it was automatically zoned A-1 per city zoning code, but staff felt it was “prudent to formalize” the rezoning. As for the site plan, Schultz added, the home that previously stood on the property has been razed, and the majority of the trees located on the northwest portion of the site will be preserved to provide buffer to the subdivision to the north and single-family home to the west. Additional buffering, he said, will be provided by adding pine trees to the western property line. According to the staff report, the site will feature two access points: one on Cheshire Road that will access a 12-space public parking lot and one on Glenn Parkway for emergency vehicles only. For pedestrian safety in the area, Schultz said, the plan calls for sidewalks to be installed from the western property line to the northern property line where a connection will be made to the sidewalks servicing the Braumiller Woods subdivision. Pictured is the future site of Fire Station 304, the City of Delaware’s fourth such facility. The combined preliminary and final development plans for the station, which the city could break ground on as soon as next month at the northwest corner of the Cheshire Road/Glenn Parkway roundabout, were approved Wednesday by the Planning Commission. City council will consider the plans in the coming weeks.